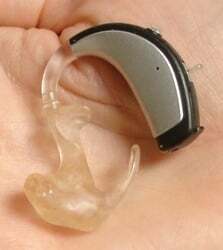 In some cases, a seemingly malfunctioning hearing aid may simply have a dead battery. To rule out this possibility, replace the battery and see if that brings your hearing aid back to life. A side note about hearing aid batteries: Each battery has a little sticker on the back that must be peeled off prior to being used. A simple way to maximize battery lifespan is to let it sit for five minutes after peeling off the sticker before putting it into your hearing aid. By letting it “breathe,” you’ll typically get a couple of extra days’ worth of battery life. If changing the battery doesn’t solve your problem, try taking off the ear bud and see if it’s blocked up with ear wax. If it is, clean it out, put it back on and listen to determine if the problem has been fixed. If your hearing aid still isn’t working properly, replace the filter on the end of the speaker wire. There’s a little tool you can use to pop out the old filter and put in a new one. If the old filter was permeated with ear wax, it may have been the cause of the problem. If your hearing aids still aren’t working after trying these three things, you’ll need to bring them to a professional. To find a Diamond Certified audiologist in your area, visit www.diamondcertified.org.